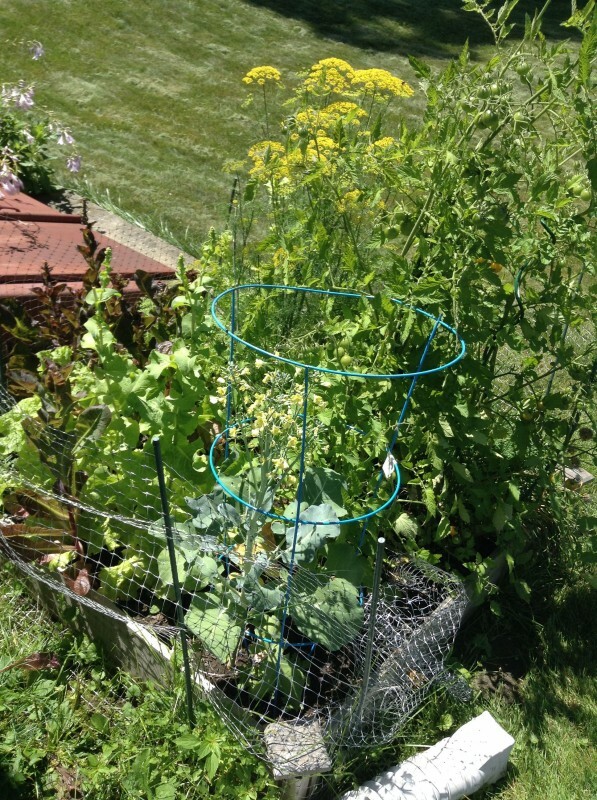 Square foot gardening is going quite well this year... all except for the tomato plants I tried to start inside (got eaten - but other plants I started inside - lettuce - transplanted quite well! ), and my poor basil plant. By the time it really put down roots outside, it is shaded on all four sides by taller plants. 3 squares of lettuce, split about 50/50 between "red romaine" bought as plants, and a curly green type that I started from seed - 3 squares seems to be a tiny bit too much to keep up with, but 2 isn't quite enough. Chives - they over-wintered themselves from last year! I didn't have to do anything! Watermelon... currently shaded by the broccoli and growing very slowly. Not sure how this wil turn out. Assorted randomly planted tomato plants that are popping up in other places... these must have come from last year's plant(s) dropped fruit. Radishes (in the spring), planted next to the chives and harvested a few weeks later. Meant to plant more but never got around to it. Mint- because no matter how hard I try to pull it all up, it keeps coming back! I am trying to transplant some to a pot so I can have some without it overtaking the garden. We used some of the dill to make refrigerator pickles, which turned out great! Plant cucumbers AND dill so we can make our own pickles all summer long. Get a real trellis (whether on this garden or on a different plot) to dedicate to cucumbers and tomatoes. Keep doing 2-3 squares of carrots! They take months to grow, but it's so worth it. Decide if I really want a fence, or not. I didn't have enough flexible netting this year to go all the way around. The plants really only need extra protection for the first month or so; maybe covering with a chicken wire cage would be better? Each year is getting better with gardening. Andrew keeps mentioning the idea of doing a second box somewhere else, and I think I might actually take him up on the idea. The kids love helping, too... and eating the fruits of our labor, of course!